This blog post is the second of a series relating to crimes and punishment under the Armed Forces Act, Cap C20, Laws of the Federal Republic of Nigeria (2004). Last time, I wrote a piece on the offence of Mutiny under the Armed Forces Act. Philip is in a big hurry to get to his interview, he has been invited by a busy CEO to come in at 12, for a personal interview and he is stepping on the accelerator, heading fast to Victoria island on the 3rd mainland bridge, when suddenly, the commercial bus – driver in front of him makes an unexpected swerve into his lane, he tries to avoid a collision, steps on his breaks and drives straight into the Peugeot 206 on the left lane. Philips looks ahead at the badly damaged 206 through his cracked windscreen and is quietly giving thanks for being alive, when 4 kacki dressed soldiers jump out of the 206, before he can say Jack Robinson, 2 soldiers are beside his window, one dishes him a hot slap while the other drags him out through the window, Philip begins to shake and stammer , he knows he is in big trouble. 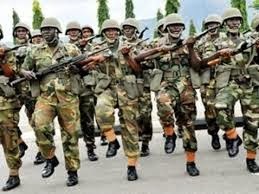 Two area boys beat – up a soldier while others cheer in the Onitsha motor-park because he slapped one of them who had earlier driven his commercial bus into the soldier’s Toyota Camry, he angrily speeds off towards the barracks and 15 minutes later, two trucks carrying about 40 soldiers drive into the park, solders disembark quickly and horse-whips begin to crack on the backs of any and all bus drivers/park touts in the garage. Today’s post is on disorderly behaviour among the ranks of the Armed forces or persons subject to service law (service law means the Armed Forces Act and it includes the military, naval, or air-force laws of any allied forces. Members of the armed forces are required to be of lawful and responsible behaviour always. Incidents involving vandalism, street fighting and acts of public nuisance are strictly under the purview of area boys and touts, not for our highly trained, highly skilled and honourable service men. 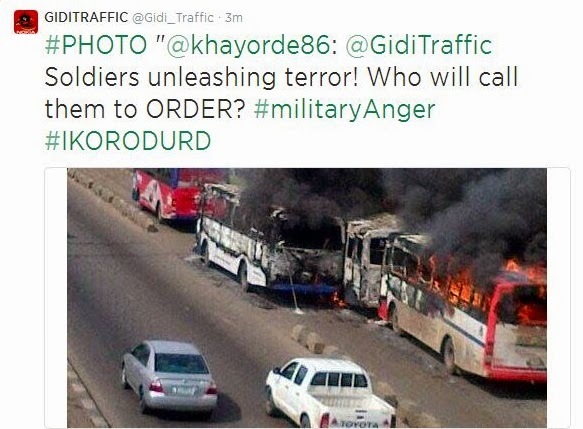 In the past, we have had instances where soldiers behaved unruly in public, a recent incident happened on Ikorodu road in Lagos where it was reported that soldiers burnt a Lagos owned BRT commercial bus and allegedly beat a few BRT drivers/ members of the public, though military authorities denied the involvement of soldiers in the mayhem. If you have lived in Nigeria for a while, it’s kind of a default attitude to life to stay out of the way of service men, there is an aura around them that oozes “you don’t want to mess with me”, LOL. Especially, if you run into a military convoy on the road with menacing looking solders holding machine guys, swinging kobokos horse whips chasing you out of the way. Is guilty of an offence under this section and liable, on conviction by a Court- Martial, to imprisonment for a term not exceeding two years or any less punishment provided by the Act. This must be an eye – opener for most people, service men breaking the above mentioned law is not a new thing, ask the danfo-drivers and motorists who have been victims of severe beatings and bullying by service men. Though, i know sometimes the motorists could be at fault, inflicting physical pain on them in my opinion is an abuse of power. Next time, you happen to be around when another person is getting bullied or beat-up by any service man, let them know they are in breach of the law. There are always exceptions though, for example in instances where service men are ordered to restore the peace during a riot or where jihadist and oil bunkering thieves are being challenged, now that’s a different ball game altogether. Adedunmade is a legal practitioner in Lagos, Nigeria and publishes the law blog “Legalnaija”.